Happy Quinoa Flake Tuesday?! Yea, we will just go with it. I’ve had this recipe written up and photographed months and months ago. Which also means those photos were really bad and taken in the owrst possible lighting. Thus, I complete re-did the recipe and re-photographed and I think it looks a lot better and even tastes better! 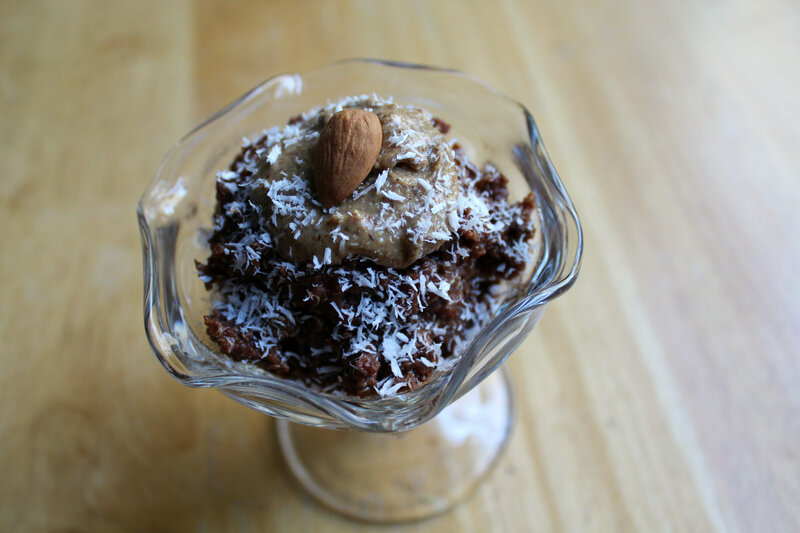 But really something about chocolate and coconut is always a winner no matter what, right?Just one of the combos you can never go wrong with. Like coconut butter, cinnamon, and a Japanese Sweet Potato. Or smoked paprika and plantains. Some other great combos? Apples and nut butter. I really can’t place my finger on a specific nut butter or apple since that always changed for me. I just finished up a jar of Peanut Butter Company’s Crunchy Original. I would pour a gallon of cinnamon on the butter, mix it around and slather it on apple slices. So good! But I also just picked up another jar of my favorite Cinnamon Raisin PB from Wild Friend’s. And another great combo? A can of Tuna fish and Thai Coconut Curry Hope Hummus! So splendid! But don’t forget to add a gallon of veggies to that too, and cashews! “Asian” power bowl and its laziest and finest 😉 The craziest combos are always the best though, like beans with mashed avocado, smoked paprika, nutritional yeast, and Dijon. If I had even though of eating crazy combos like this a few years ago, I would have fainted. Most of the things I eat I think most people would run the other direction, unless of course you are a foodie or blogger. We all eat weird stuff, am I right? What’s not that weird though, is these Quinoa Flakes. I am pretty sure everyone has either had a Mounds or Almond Joy sometime in their life. If not, shame on you (even I have had those candies, and that is saying something!). The only thing about this “Almond” Joy is that it is healthy and nourishing, not sugary and well…bad. 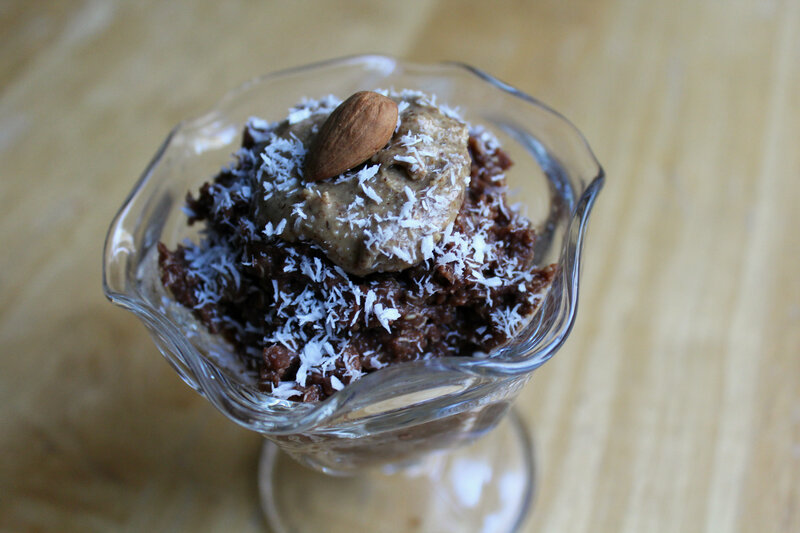 + In a microwave safe bowl, combine quinoa flakes, cocoa, and unsweetened coconut. Mix. Then add the water (optional stevia) and stir to combine. + Microwave on high for 2 minutes. Remove (safely, it is hot!). 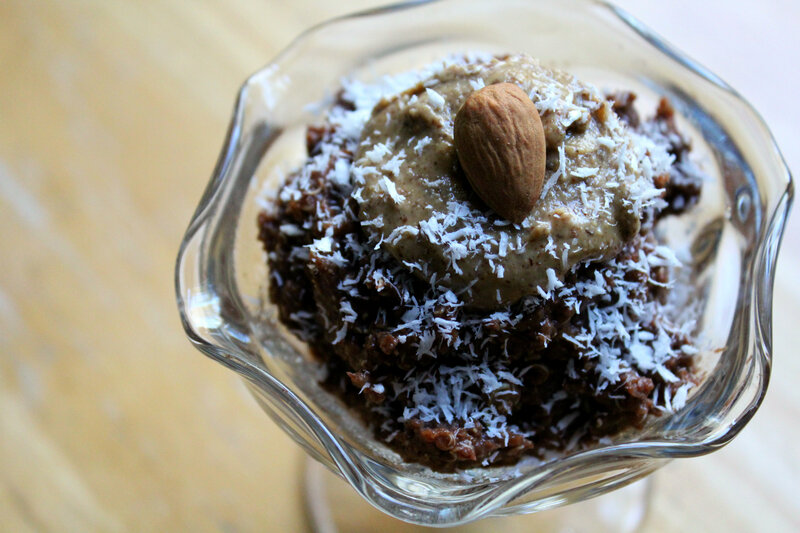 Then stir in the coconut butter, top with the almond butter, sprinkle more coconut on top and place a cute almond in the middle! + * If you want buckwheat cereal, use the 1/4 cup of buckwheat, but increase the water to 3/4 cup and microwave for 3 minutes and 30 seconds. I really am glad the lighting is better now that the sun rises so early in the morning, so when I make my breakfast I can photograph it without it being in total darkness. But the sad thing is I lost my sweet spot in my room since my AC is in the 1 lowly window I have. Now Instead of a bright sunny summery room, it is dark and gloomy all day. Really sad, but it gets super hot up there so an AC is a must! You know, a good combo would be a room made of windows and central air 😉 That would be lovely! + What is your favorite food combo as of late? + What is/was your favorite candy? I always had a thing for Almond Joys and Mounds, as well as Junior Mints (frozen! ), and gummy bears (frozen too!). Yum, yum, yum. Have to take dessert to a backyard get together. Gonna make this! oops sorry but this sounds delicious. Thank you for letting me know love! This looks wonderful! You were one of the most clicked links at Savoring Saturdays and will be featured when it goes live at 7pm tonight. Congrats! YUM! Thank you for sharing at REAL Food Friday! YOU have been featured today at Mary’s Kitchen. Looking forward to seeing what you share this week. Yum! Definitely trying this! Thanks for sharing at Savoring Saturdays! Thanks for linking up with Manic Mondays! This has to be the healthiest dessert involving chocolate that I’ve ever seen. Thanks for bringing it to foodie friday. Pinned. You should! It is such a fun breakfast to wake-up for! Great! At least your heard of them! So many people haven’t 😛 defineitly give them a try! Great recipe and sounds so healthy but delicious.. Shared on Pinterest. Thanks for sharing on Real Food Fridays Blog Hop. Thanks! I hope you get to try it! Looks incredible!! Thank you so much for linking up at Tasty Tuesday! Your recipe has been pinned to the Tasty Tuesday Pinterest board! Please join us again this week! Apples and nu tbutter…o…I could simply live off of that for the rest of my life! Why is it just so damn delicious?! Chocolate rocks 😉 I am definitely not a vanilla girl (although I do like it! ), but chocolate all the way. I think I use unsweetened cocoa powder in something everyday! 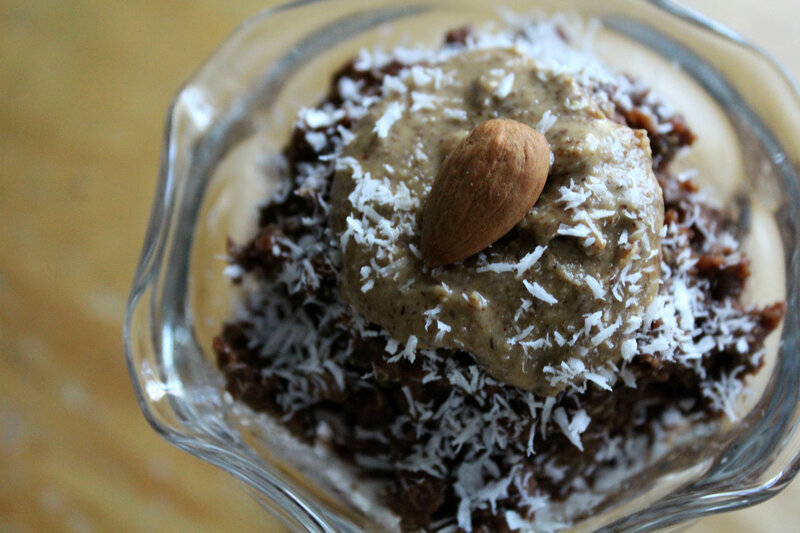 I liked Mounds as a kid and Almond Joy as adult – basically if it has coconut & chocolate I’m checking it out! Admittedly, I’m not a huge quinoa fan but would love to try this out with another type of grain – creative treat! Try the creamy buckwheat cereal from bebs red mill then (that’s my other #1 hot cerealnof choice)! Haha, not a dessert, this is a hot cereal for breakfast! I need to try quinoa flakes! This looks delicious. Oh this looks so good! Always looking for new ways to use quinoa flakes! Thanks Rachel! Its so fun to come up with new combo s to keep it interesting! I bought quinoa flakes for a veggie burger recipe and haven’t used them since! This recipe calls for breaking them out of the cupboard! Looks amazing. Score! Pull ’em out right now then, now time to waste! 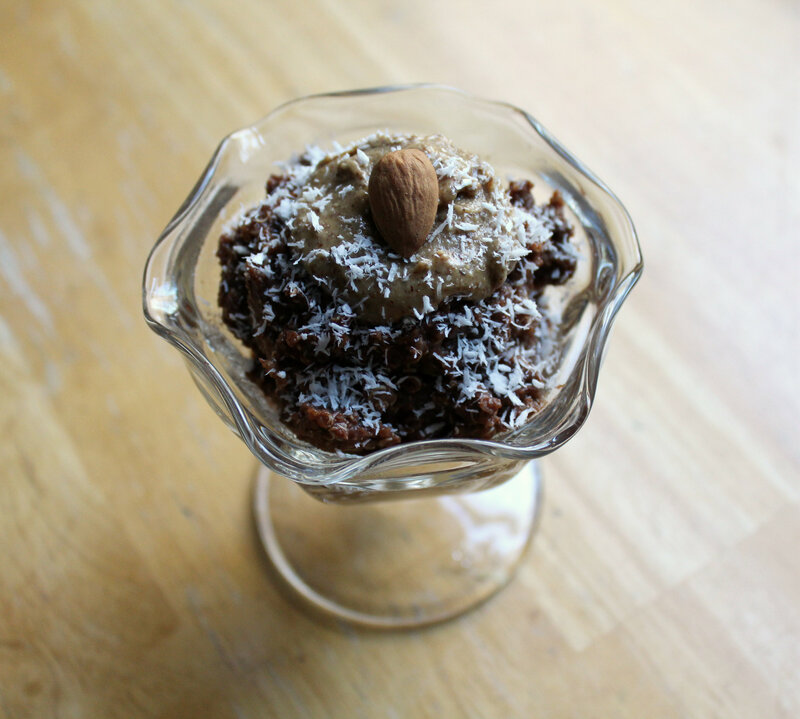 Almond Joys are one of my favorite indulgences… love that your version is a healthy way to enjoy that taste!! Great idea! Pinned this for later! Looks fabulously yummy! pinned. found at tasty tuesday linky!. Have a great week. I cook with quinoa all the time but I’ve never actually tried the quinoa flakes! This looks like a great place to start! Give them a try! They are so good and you can bake with them, use them as a hot cereal, ganola, anything! This is the perfect time to try quinoa flakes then! DAMMIT I want to try quinoa so badly!!! 🙁 I have heard such great things! Alas, my stomach will not allow it. But that doesn’t mean I cannot drool over your photos! HA HA and they’re GOOD PHOTOS! We must find a comparable substitute for you ASAP! That looks delicious! Thanks for joining in my linkup, I’m really looking forward to trying this! I love “weird” combinations too, sometimes they don’t work but when they do it’s awesome. Yum! This looks delicious! At the moment I am loving peanut butter and raisins! I love finding new recipes that I never would have thought to make myself. I like quinoa but haven’t tried it in “non-traditional” ways. Usually I just make it as a side for dinner. Thanks for sharing! This isn’t normal quinoa, this is quinoa flakes! It is the flattened form of quinoa! Kind of like quick cooking oats! Interesting combo! Looks really good and creative. Those food pics are hard for me too. mmmmm… I LOVE quinoa flakes! They are a total essential for breakfast! I met my now husband through LURRRING HIM with mounds bars!!! Quinoa Flakes are just quinoa that is rolled into a flat quick cooking flake! Mmmm. I have been working on this combo in pancakes form too 😉 Soon it will be perfect!